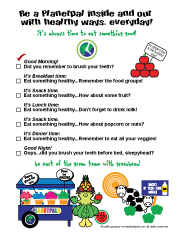 Use this Healthy Kids Checklist and Be Planetpal, too! One of the best ways to be healthy inside and out is to be a Planetpals every day! That means eating healthy and doing healthy things. Take care of your body and take care of the earth. Print this fun checklist--put it on your fridge or tape it to your wall and remind yourself to be a Planetpal, everyday in every way! What to do each day!